Although Melbourne Coffee Review doesn’t think much of coffee art, I am still out to perfect it. 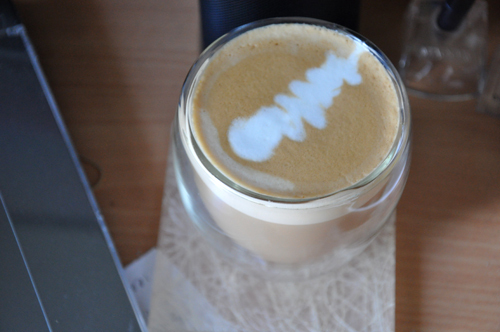 There are difficulties with home machines in getting the milk right (ie. hot enough, quickly enough) but this morning I must have done something right, as the picture suggests; should my technique have been slightly better perhaps we would’ve seen the elusive free pour leaf (which is the the one and only goal – until I reach that and find something else I’d like to do). So to clarify, I don’t work as a barista – although I recently indulged in a course that was fun and taught me a little more than I knew already. I’d rather work as a designer once I finish this last semester of uni, being a barista might possibly be the temporary fall back plan in case I wind up living out in woop-woop (That story to come when I’m allowed to share it) although I’d probably try wedge myself into some kind of photography job if that ever occurs. Own a grinder with grind settings… (one day, one day). However the coffee you can make with pre-ground, if you’re careful can be okay, so do proceed. Do not freaking wave the jug up and down, it should just sit there. Just one little thing, there should be a noise when frothing milk, you are quite correct about the texture, tight small bubbles is what you are after, but there should be almost a slight sucking noise, and what you are trying to do it fold the milk over itself to get that smooth velvety texture. And use fresh full cream cold milk. If you can get the milk to do a mini whirlpool, you are there. and yes…the grind is the most important aspect, along with fresh beans…not rubbish like you buy from Coles. yes. but none of the evil froth and bubble noise! quite right, how dissapointing is it when a ‘barista’ who you have just paid $4 to, thinks he is making a milkshake!